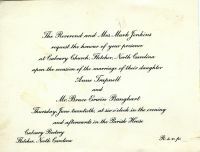 [S850] Jenkins/Kloman/Trapnell Info, Maria Vlattas, Anne (Nancy) Trapnell Jenkins married Bruce Erwin Banghart 20 June 1957. They had 5 children. They divorced and she married William (Bill) John Betts (born 18 July 1912, died 5 July 2005) in 1985. Nancy died 1 June 2013 in Lansing, MI.